The exterior of your home says a lot about you and your style. If it's time to add a fresh coat to your exterior, or you simply want to change or update the colors, as a responsible homeowner, it's essential to be well informed. Fresh paint not only brightens and updates a home's exterior, it also provides a protective seal against weather damage. With a small investment in exterior painting for your home, you can add curb appeal and value to your property with a new look almost instantly! Are you going to call in a professional contractor or will you be attempting this exterior painting project yourself? You may be an energetic and enthusiastic DIYer, but due to the height of this kind of project and other risks involved, it's generally recommended that you call in a contractor to get the finish you want. Finding the right contractor for your exterior painting project is important. You want to make sure your cost to paint a home's exterior is kept down without sacrificing a job well done. Your contractor can discuss your specific needs and offer budget friendly solutions to any issues that may arise. Naturally, larger areas will cost more to cover. Here are some average sizes to give you a better idea of the cost to paint a home exterior. 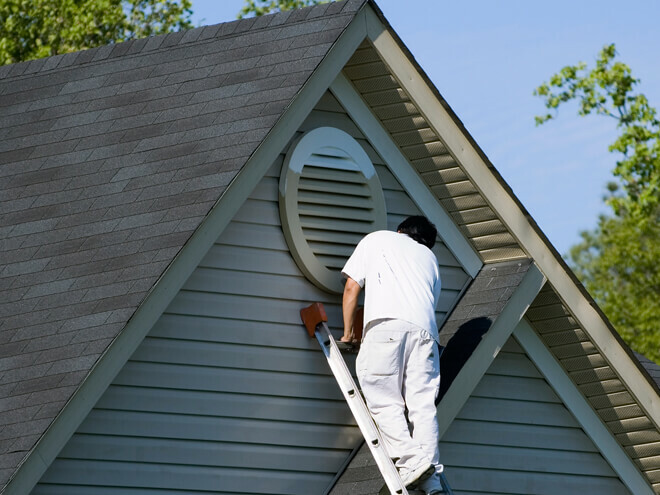 Should you opt to paint the exterior of the home yourself, you will need a ladder, scrapers, buckets, paint, brushes and paint pans, rollers and rolling handles (especially for multi-level homes), sandpaper, painter's tape and more. The cost and quality of the paint itself will make a big difference in the overall price. It's generally recommended to use a primer alongside two coats of paint. So remember, always double the number of gallons you'll need because it takes two coats to cover one home exterior. One gallon of paint can set you back anywhere between $20 and $55 depending on the quality. On average, a gallon of paint should cover roughly 350 - 400 sq ft.
As an example, should your home's exterior painting project cover 2,100 sq ft, you will require about 6 gallons of paint to complete one coat, and double that to do the second coat. For 12 gallons of paint, you could be paying anywhere from $240 to $660 just on paint. You can always try to negotiate with a contractor for a better deal on some premium paint. If your home has vinyl or aluminum siding, your exterior painting project will require specialized paint, which will also add additional costs to your bottom line. Most professional painters earn an average of $20 - $35 per hour, but you'll likely be paying for a team of painters to paint your home's exterior. Smaller areas could take between 1 - 2 days to complete, but a whole house will take anywhere from 3 - 6 days to prep, complete, and clean up. For a whole house, expect to pay anywhere in the region of about $2,000 on labor. It also important to keep in mind that, regardless of what it's made of, your home's exterior will generally need a good cleaning before your project can begin. Some contractors may not include this cost in their estimate so it's important to clarify this ahead of time. Even when in fairly good condition, siding that's older or showing signs of mildew will require more time to prep and clean, thereby increasing your overall labor costs. Similarly, older homes may still have lead in their paint, requiring your contractor to scrape it off. What Can I Expect To Pay On The Overall Cost To Paint a Home Exterior? Some materials cost more to paint than others due to their texture, specialized paint required, and the preparation time needed before the painting can commence. Depending on various factors, you can expect to pay anywhere from $800 up to as much as $3,800 to paint your home exterior. Most American homeowners, however, spend an average of $2,800 on painting the exterior of their home. If you are considering having your home's exterior painted, it's important to know the estimated cost of your project before committing to start your project. In general, it's recommended to get more than one estimate from local professionals in order to get an idea of regional and current pricing trends in your area and help you calculate your budget. How Can I Find a Professional Contractor Near Me To Paint My Home Exterior? By simply entering your zip code in the space provided below, you can be connected with local professionals who specialize in exterior painting. By doing so, you can also take advantage of a 100%, absolutely FREE estimate on the cost to paint a home exterior. Don't wait! This offer comes with absolutely no obligations to hire, purchase, or sign any contracts! The cost to paint your home's exterior will depend on several factors. Get in touch with professional in your area to get a more accurate breakdown of the overall cost of your particular project.